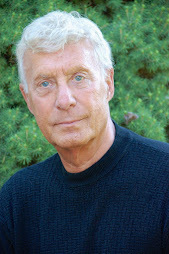 Ludwig’s major works include “Leading Ladies,” “Moon Over Buffalo,” “The Game’s Afoot,” “Baskerville, The Sherlock Holmes Mystery” and “A Comedy of Tenors.” His musicals include “Crazy for You” and “An American in Paris.” Many of these have been seen on CLE stages. 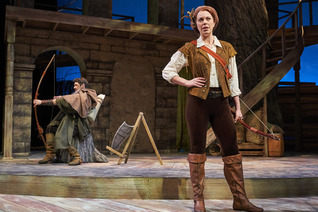 Ken Ludwig’s “Sherwood the Adventures of Robin Hood “is a romp full of swashbuckling and romance, and it’s also a moving tale of a young man’s discovery that everyone has a responsibility to care for his fellow man." Of course the script, which is set in Sherwood Forest and the town of Nottingham, England, around 1194, is peopled by Greedy Prince John (Price Waldman) and his bad henchmen-- Sir Guy of Gisbourne, The Sheriff of Nottingham, and the good guys-- the dashing “outlaw” Robin Hood, the band of Merry Men (and women) the lovely Maid Marian, Friar Tuck. Little John, Deorwynn (Andrea Goss) and King Richard the Lionheart. As is the case with Ludwig’s other plays, farce and slapstick runs wild. Add sword fights and arrows flying around the stage, direct involvement of the audience, and lots of chaos, and you have the possibility of delight. 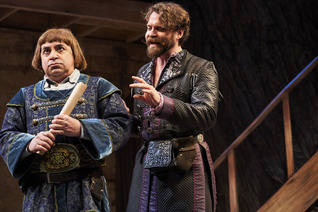 To make farce work, a creative director and a disciplined cast is needed. Having an inventive set designer also helps. Fortunately for the audience, CPH has all the necessary requirements. Immerwahr pulls out all the stops for “Sherwood.” Shticks, gimmicks and slapstick abound. Swords clang, actors fly around stage with abandonment, sexual innuendoes erupt, ramparts are attacked, actors fall off buildings and are pummeled with glee. It’s all in good fun. Farce at its very best. Misha Kachman’s impressive set, complete with a massive tree, platforms, and a revolving center stage which is cleverly used for moving set pieces, fight sequences and acting stunts, becomes as much a performer as a visual delight. J. Allen Suddeth’s choreographed fight scenes are obviously staged, but delight with their well-executed movements. The sequences often not only evoke laughter, but prolonged applause. Handsome Zack Powell is Robin Hood, swashbucklingly perfect, displaying an impish quality that made the character endearing. Amy Blackman as his lady love, Maid Marian, nicely textures her acting and shows masterful physical moves as the “#Times Up” modern woman before her generation. CAPSULE JUDGMENT: “Sherwood” is for those who love to laugh at the ridiculous and see a well-written farce performed at the highest level. The staging, the acting, the technical aspects are superb. Go…laugh…escape from the ridiculousness of what’s going on in this country and the world, and have a good time!!! 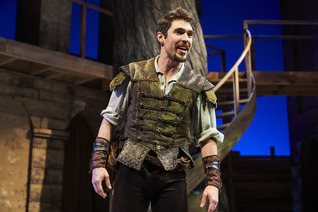 “Ken Ludwig’s Sherwood the Adventures of Robin Hood” runs through February 24, 2019 at Allen Theatre in PlayhouseSquare. For tickets call 216-241-6000 or go to http://www.clevelandplayhouse.com.